Even if you leave out the first quarter of 2009—when the recession that started in December 2007 was still ongoing--President Barack Obama has presided over the lowest average first-quarter GDP growth of any president who has served since 1947, which is the earliest year for which the Bureau of Economic Analysis has calculated quarterly GDP growth. In the seven first quarters during Obama’s presidency, it has declined by an average of -0.43 percent. And if you leave out the first quarter of 2009 and look only at the first quarters of the six years since the recession ended, it has averaged only 0.4 percent. In the six years of Harry Truman’s presidency for which the BEA has calculated quarterly GDP, the annual rate of growth in GDP in the first quarter averaged 4.5 percent. During President Eisenhower’s eight years, it averaged 3.2 percent. During Kennedy’s three years, it averaged 4.9 percent. During Johnson’s five years, it averaged 8.3 percent. During Nixon’s six years, it averaged 5.3 percent. During Ford’s two years, it averaged 2.3 percent. During Carter’s four years, it average 2.4 percent. During Reagan’s eight years, it average 2.1 percent. During George H.W. Bush’s four years, it average 2.9 percent. During Clinton’s eight years, it averaged 2.6 percent. And during George W. Bush’s eight years, it averaged 1.7 percent. President Obama took office on Jan. 20, 2009. In the first quarter of 2009, GDP declined at an annual rate of -5.4 percent. In the first quarter of 2010, it grew by 1.7 percent. In the first quarter of 2011, it declined -1.5 percent. In the first quarter of 2012, it grew 2.3 percent. In the first quarter of 2013, it grew 2.7 percent. In the first quarter of 2014, it declined -2.1 percent. And in the first quarter of 2015, it declined -0.7 percent. In these seven first quarters that Obama has been president (2009 through 2015), the annual rate of growth in GDP has declined at an average rate of -0.43 percent. But the National Bureau of Economic Research says the last recession, which began on December 2007 did not end until June 2009. If you leave out the first quarter of 2009, and only count the six years (2010-2015) since the recession ended in June 2009, real annual rate of growth of GDP in the post-recession first quarters of Obama’s presidency has averaged 0.4 percent. When GDP declined at -1.5 percent in the first quarter of 2011—which was after the recession and two full years into Obama’s presidency—some blamed it at least partly on the weather. “Some of the slowdown in growth was linked to bad weather in early 2011 and an 11.7 percent decline in defense spending,” said a Reuters story of May 27, 2011. But there seems something more at work here than climate patterns--or the Obama presidency. 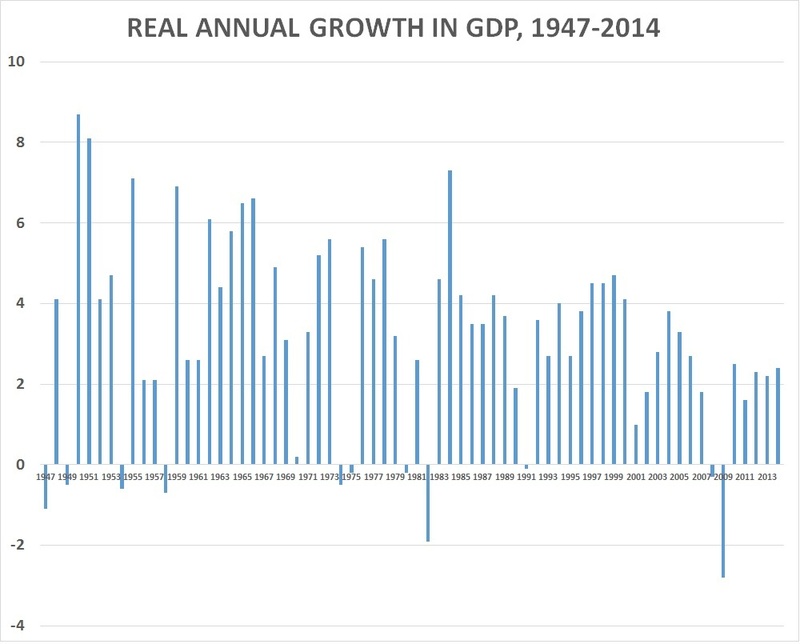 Under previous presidents, real GDP sometimes grew massively during the first quarter. In 1950, under Truman, for example, GDP grew at an annual rate of 16.9 percent in the first quarter. In 1955, under Eisenhower, it grew at a rate of 11.9 percent. Under Johnson, in the first quarters of both 1965 and 1966, it grew at a rate of 10.2 percent. Under Nixon, it grew at 11.1 percent in the first quarter of 1971, and 10.2 percent in the first quarter of 1973, it grew at 10.2 percent. Under Ford, in the first quarter of 1976, it grew at 9.3 percent. Under Reagan, in the first quarter of 1984, real GDP grew at a rate of 8.2 percent. But since 1984—more than three decades ago--there has been no first quarter, in any year, under any president, when real GDP grew even as fast as 5.0 percent. The closest it came was in the first quarter of 2006, when George W. Bush was president, and it hit 4.9 percent. 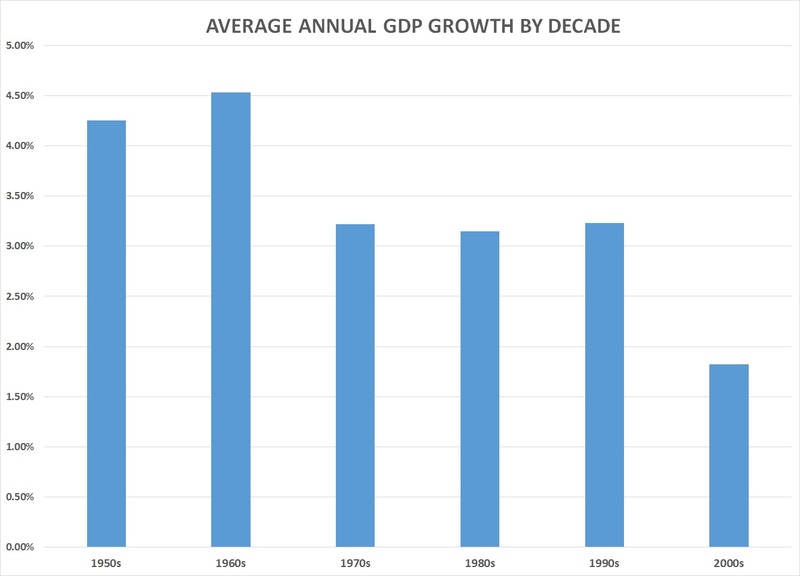 In the decades starting after World War II, average annual growth in GDP peaked in the 1960s. 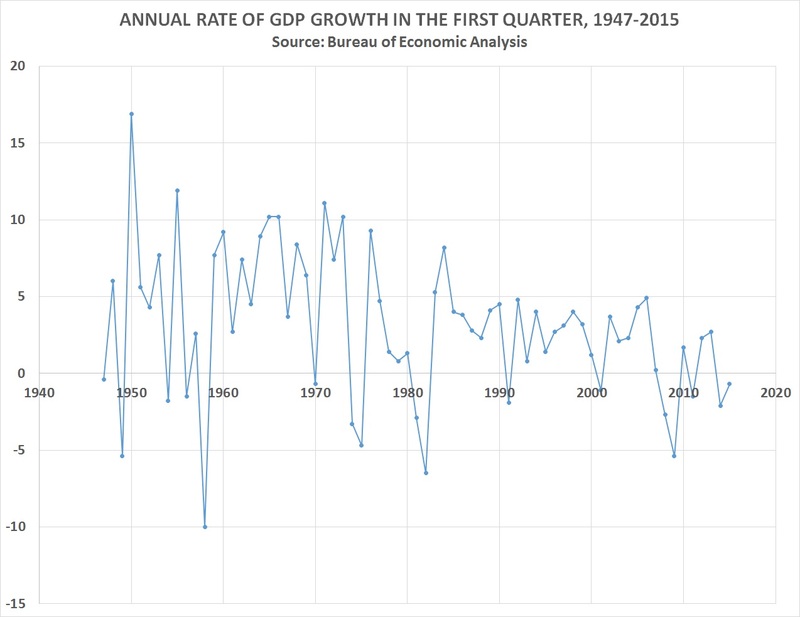 In the 1950s, annual growth in GDP averaged 4.25 percent. In the 1960s, it climbed to 4.5 percent. But it dropped to 3.22 percent in the 1970s, then 3.15 percent in the 1980s, before ticking up to 3.23 percent in 1990s. In the 2000s, it averaged only 1.82 percent. In the first five years of this decade (2010-2014), annual growth in GDP has averaged 2.2 percent. But that is less than the 2.7 percent it averaged in the first five years of the last decade (2000-2004) which was before the recession hit at the end of 2007 and brought the decade's average down to 1.82 percent. If it were to maintain an average annual rate of 2.2 percent for the next five years, the American economy of this decade would still be growing at less than half the rate of the 1960s. Should the long-term decline in U.S. economic growth be attributed to cold weather? Or should people in Washington, D.C., start looking around them for an anthropogenic cause.